A DREAM – IF IT’S WORTH DYING FOR, SHOULDN’T IT BE WORTH LIVING FOR? Posted on January 21, 2014	by Denise Banks-Grasedyck, Coach. Consultant. Speaker. No emotion, just a strong, determined look and eyes that flickered with a flame from somewhere deep inside; you know, that place where true conviction, searing passion and our biggest dreams reside. To say the least, I was impressed, moved and fascinated. A quick shudder went up my spine causing me to tremor. The seventeen-year-old caught my involuntary spasm, stopped speaking, shifted upward and smiled almost apologetically. This week there are celebrations around the world to honor Dr. Martin Luther King, Jr. and his legacy of peaceful change and his dream of a world in which fear, hate and discrimination are completely displaced and replaced, by love, peace and justice. Dr. King had a dream that he was willing to be beaten, jailed and ultimately, to die for. MLK’s dream is alive in the transatlantic dialogue! 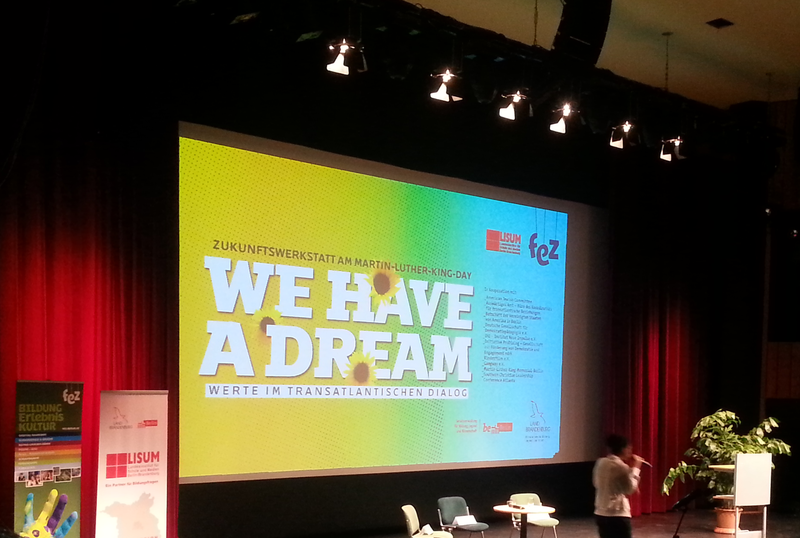 MLK celebrations are also taking place here in Berlin, Germany, where I live. I was thrilled and honored to be invited to participate in one of those events entitled, “We Have a Dream – Values in the Transatlantic Dialogue”, where I had the opportunity to facilitate discussions, among other things, on the causes and responses to racism and discrimination with a group of 15 to 19 year olds from different regions of the country. One of the students I had the privilege to work with was the seventeen-year-old young German, whom we will call Daniel1, who lives in one of the regions known for its right-wing affinity and who has been the target of multiple violent beatings. Daniel has been attacked repeatedly simply because of his conviction to the dream that he shares with Dr. Martin Luther King. Daniel is committed to creating a world of peace, freedom and justice for all people regardless of race, religion or sexual orientation, and he refuses to let anyone or anything get in his way. He is utterly committed to his dream, his big goal based on his core values and Daniel’s words, his actions; really everything about him is aligned to making it happen. This kid is on fire! When we begin to look at how their goals and actions support and align with the dream, the fire dims to glowing embers, doused by fear. The bigger, the bolder our dreams are, the more daunting it can seem to us. The more we value something, the greater is the fear of taking the wrong action, so we take no action at all. But a dream kept in a locked closet, or sealed away inside us, is nothing more than future regret in its seedling stage. Fortunately, most of us have dreams that do not require us to give our lives, they simply require our commitment and willingness to take action – even if we have to take some hard knocks and like Daniel, the occasional a**-whippin’ to make it happen. Do you have a dream worth living for? at +49 176 556 19 112 or e-mail me at the address below for a free consultation. And honestly, if you believe something is worth dying for, it surely deserves your best effort at living for! 1 The name has been changed for privacy protection. ABOUT THE AUTHOR: I am Denise Banks-Grasedyck, a certified professional coach, specializing in personal and professional development. I am an entrepreneur, wife mother, burn-out prevention advocate and I am also known as Your Ideal Life Expert. I work with people around the world, especially overcommitted professionals living on the edge of burnout. I help them regain control of their lives, avoid burnout or recover from it, so they can manage a successful career and an active family and still have time and energy for themselves and the things which they are passionate about. HOW WE MAKE IT HAPPEN: I help my clients create a clear picture of what their ideal life looks like and develop a mindset, a roadmap and an action plan to get them from where they are now to where they want to be, in as little as 12 weeks. The amazing result is that my clients feel healthier and less stressed, their job performance is top, they have more time to spend with family and friends and they love living a life that is the ideal life for them. The best feedback (and the most heart-warming compliment) I have ever received from a client? This entry was posted in Insights, Out of the Comfort Zone, Take Charge of Your Life and tagged authenticity, do what you love, follow your dreams, ideal life, personal values, take charge. Bookmark the permalink. 14 Responses to A DREAM – IF IT’S WORTH DYING FOR, SHOULDN’T IT BE WORTH LIVING FOR? Wow, Denise it must have been a very powerful day to be involved in. Thank you for sharing Daniel’s story. He sounds like a remarkable young man. I believe with attitudes like his that change is possible and contagious. I’m sure having you as a mentor meant a lot to him. Thanks for commenting, Wanda. It really was amazing and honestly, I think I got more out of that day than I gave. Funny how that expression ‘worth dying for’ doesn’t really serve us, does it? I get the power of the expression and I love your point that if it is that important, we should be living for it! Language is everything and that is one place I am going to change mine. The power of a dream is more than more human minds can comprehend, bigger than us. Definitely worth living for! Thank you for taking the time to comment, Aly. Language is definitely more powerful than we often realize; it shapes our world in many ways. Many wonderful people have sacrificed their lives for causes that they believed in and that is made even more powerful because of the fact that they lived for those same things. Here’s to living your dreams! We just did a drama in our church about Martin Luther King Jr. Remembering his life really does remind us of the power of conviction. But, what came up as the discussion after the drama, was the power of Courage and how courage is at the base of all transformation. It is when we hit that fork in the road, and when we are willing to take that stand, and our Courage kicks in, that we step over any obstacle, any excuse. Thank you, Wendi! Courage is definitely a necessary component in living a purpose-driven life and in every Transition and every Transformation. Dr. King definitely modeled both conviction and Courage. Thanks for sharing this powerful experience Denise. Equality is one of my top core values and something I’ve fought for my entire life. Another is freedom. I love the idea of framing your dreams around what’s worth living for. My wish is that everyone can find something to be so passionate about. Thanks Elaine! I share your wish ” that everyone can find something to be so passionate about” and that is one of the many reasons that I love being a certified coach. I often get to be a part of that discovery process when People are connecting with their core values and fully claiming their passions. You speak a powerful truth! Speak on Freedom Fighter. What an inspiring young man, and that must have been an incredible experience to be a part of, Denise. I agree- our dreams are “to live for”! Thank you for this inspiring post. Thank you, Rachel. Yes, it was a great experience for me! I love the positive twist you brought to this thought … instead of what is worth bying for, what is worth living for 🙂 Brilliant! Thank you, Jennifer! I appreciate your upliftung comment.